A potential Finals matchup? | ENTOURAGE BASKETBALL INC.
Two potential championship favorites , with clashing playing styles, finally compete in one of the season’s most anticipated games. The reigning champs versus the established team full of SBL-ProAm veterans; E.B.I versus Proform. Both teams were riding long winning streaks into this match, EntourageBBall had won 7 straight, while Proform came into last Sunday’s showdown with a flawless 8 – 0 record. With only 2 more games left before the playoffs, this was a grand test for both teams, first and second in the standings, and a win would be decisive for playoff pairings. Surprising then that at the (delayed) start of the game, Proform only had 5 players in uniform, with their core guards and scorers all traipsing into the gym mid-first quarter. By then, EntourageBBall had sped off to a 16-5 lead, controlled the boards and pace in the early stages. Opting for a traditional lineup to start the game, E.B.I player-coach Dave entrusted veteran guard and sparkplug Chi with the bulk of ballhandling duties. Sharing the backcourt with him was reliable scoring guard Jerel while Sebastien, Lester and Jean Baptiste manned the frontcourt. A nervous start, by now a norm for the defending champs, was quickly negated by nice execution of set plays and the relentless transition pace the guards set. All this being possible because the starting unit did everything right on defense, limiting second chance opportunities and forcing bad passes. This would not be a blowout however, Proform boasts one of the better backcourts in the country, Jordan Webb and Proform leader Noel Pollock are more than a handful for most teams to defend. And upon their entry into the game, midway through the first quarter, the Entourage lead shrunk rapidly. Webb with his relentless drives to the basket and Pollock, a knock-down three point specialist, were able to impose their wills as the first half progressed. What had looked like an easy win was now in the early stages of a baskebal battle royale. E.B.I was unable to keep up the high tempo by the latter stages of the first half and turned the ball over too many times. The second unit of Terence, Mike, Manuel, Dave, Javier and Josh rushed shots and got lost in transition leading to the opponents closing the gap to 5 points (20 – 25) at the halftime buzzer. The absence of forwards Alex (1 game suspension) and Tolga (on hiatus) was evident when the 2nd unit played, as Proform had four very tall players in their lineup to E.B.I’s two. Luckily, Proform’s tactics did not take advantage of the size mismatch, the opposing guards were happy to launch outside shots, and even the bigs were shot-happy, barely attacking the paint. The third quarter was determined by who made less mistakes, unfortunately it wasn’t the men-in-green. E.B.I repeatedly lost their men in transition, leading to open shots and second-chance points for their opponents. Proform wrestled the lead away from the champs and started the fourth quarter up 38 – 34. At this stage Proform’s 3-point shooting became a problem, specifically Noel making them from allover the court. Up until the fourth quarter, Sèbastien and JB had been quiet on offense, while providing great help defense and doing battle on the boards. The flow of the game changed when they (and veteran guard Javier) chipped in to score more as the see-saw fourth quarter progressed. Neither team could pull away with an extended run, EntourageBBall moved the ball well, getting to the free-throw line and Proform countered with long range shooting. The game became increasingly physical, peaking when one of the Proform bench players dangerously grabbed Jean Baptiste around the neck as he rose for a layup, sending him crashing to the floor: an unsportsmanlike foul was awarded, but tempers flared on both benches. After a botched rotation on defense, E.B.I conceded the lead on a 3-pointer by Proform’s center with 44 seconds to go in regulation. To the rescue came Jerel Chavis, E.B.I shooting guard and semi-pro player, who hit a fadeaway jumper to tie the game and send it to overtime. Overtime was a nerve-wracking five minutes of missed shots, scrambling for loose balls and on the side of the champs, a lot of missed Free-throws. Even with two of the Proform starters fouling out, the champs could not gain separation from the pesky challengers whose second unit showed a lot of heart. The game was won on hustle: JB finished an And-1 layup, Sebastien snagged 2 offensive rebounds after missed free-throws to secure possession, Javier defended his heart out against the hot-shooting Noel and finally Jerel sinking his last shot at the line to give E.B.I the one-point win. 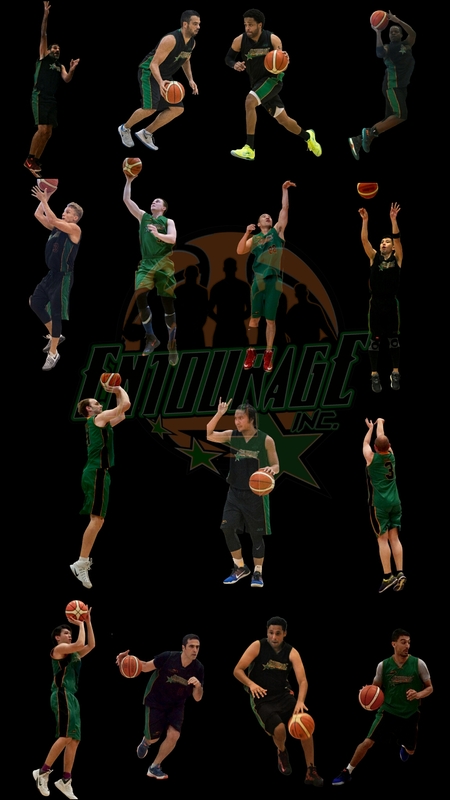 The victory, their 8th straight, puts EntourageBBall Inc in a great position heading into the Crossover League playoffs. Retaining first place in the standings while narrowly defeating one of the strongest challengers to the title must give the players and coaches a boost in confidence two weeks before the start of the post-season.